We woke up nice and simple today. And had heart sprinkles on our cereal. It’s a sweet little day to talk about love. And kindness. And that sort of thing. And a day to treat the baby in my belly to some deliciousness. She needed some goodness too! And what will I give my husband for Valentine’s day? Well, I received a water color painting from Keri at this shop. I’m kind of in love with it. It’s my husband as the P.A. (which he’s in school to become)…….and my little kiddos as the patients. And maybe my little girl’s favorite pink bear is up on the office wall, as the ‘anatomy drawing’. And my little guy loves trains, and that’s up on the other wall. All of the many details included in the painting are simply charming. Since my husband doesn’t have an office, or somewhere official to hang the this, it’ll hang out next to him while he studies for school. Thanks Keri, from BeDoodled. We both love it. One more thing I have to mention. Do any of you remember that little giveaway I hosted before Christmas (found here) where I gave away a few things from my stash? Well, the winner of the ruffled scarf is from Australia and she declared that if she won, she would take a photo of the scarf next to a kangaroo or emu or something. Well, the scarf made it safely to Australia……and Maya kept her promise. 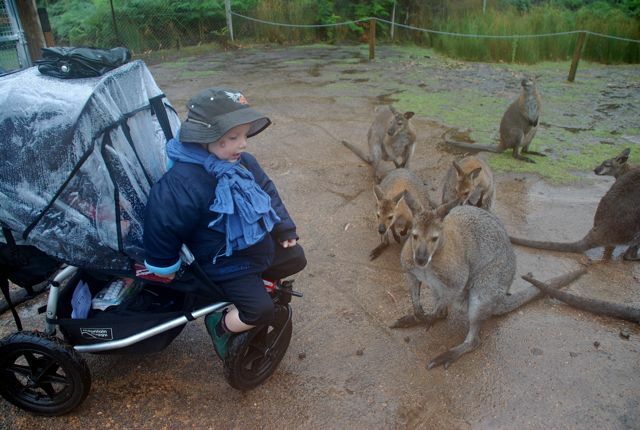 Here she is next to some wallabies (small type of kangaroos she explained to me)……flashing that sweet smile. 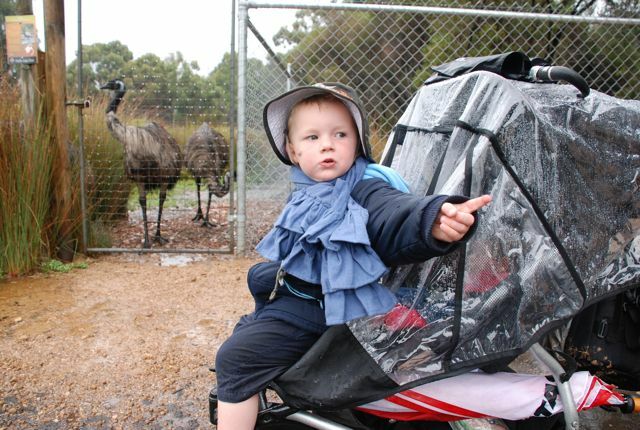 She even used her little guy as a model to display the scarf in front of some emu’s and more wallabies. Anyway, hope everyone enjoys their Valentine’s Day (if you celebrate). We are bound to overeat a bit on pink and red candies and all things chocolate. And use plenty of fluffy and sparkly materials to create a few Valentine’s day cards. Is your house back to normal? Ours isn't. That picture is soo cute! I love how it has little details from your family. And the edible arrangement is so easy and pretty. I'll have to try it some time! That picture is too cute! My hubby needs one too since he's in med school and may specialize in pediatrics! Happy Vday!!! My hubby is a PA for the Army. :) Good luck to yours! Have a lovely day! Oh! PA's are the best. My hubby just recently finished PA school. Gotta love the pic. . .
My hubby is also a PA and I love that picture. So cute! 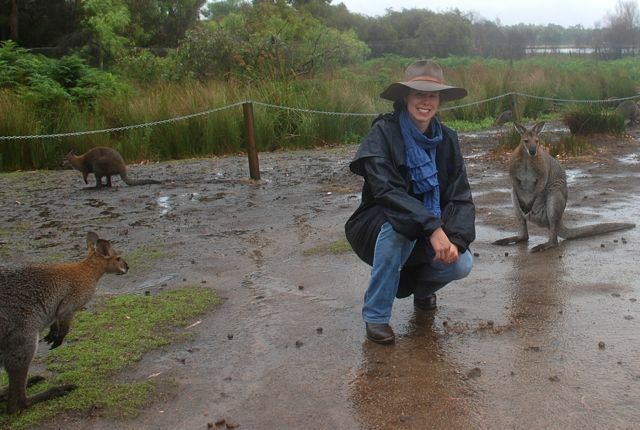 I love the picture of the lady wearing your scarf with the kangaroos!!! That is so exciting!! Have a great Valentine's day!! Peanutbutter is the best for the child – I am sure about it! How I miss Reeses!!! It is already 13 years since I was for one year in America, but I still miss this good stuff!!! Love that Maya kept good on her promise. She and her little guy are great models for your beautiful scarf :). Hope you have a happy day! Oh that scarf is adorable, where did you find it? By the way, we too are big on heart shaped or pink foods. Made some wonderful fluffy pink cupcakes for my kiddos. I read for real that a little dark chocolate every day helps prevent pre-eclampsia during pregnancy so enjoy!! What a sweet gift for your hubby–I'm sure he loved it. Those reese's hearts are the BEST valentines candy ever! Yum! What a unique gift for him!! SOOO what did he get you??? coverage! Keep up the amazing works guys I’ve added you guys to my blogroll.